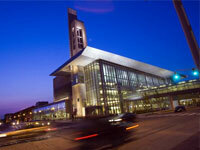 INDIANAPOLIS -- "Do no harm" are words often associated with the oath taken by physicians when they become practitioners. Amber Comer's research may add another phrase: Be kind. As an assistant professor with the Department of Health Sciences in the School of Health and Rehabilitation Sciences at IUPUI, Comer is conducting research into a new way for increasing empathy among physicians. The need to do so has been identified by the IU School of Medicine and others within the health care profession. "You can be extremely bright, an excellent learner and an outstanding physician but absolutely lack empathy, which has implications for patient care," Comer said. "At the end of the day, a patient doesn't really know if you are a great doctor. They just know if you were empathetic, if you were nice to them." Comer is collecting data for a study that has several components, including one in which she is evaluating how empathetic neurologists are when they speak with family members of patients who have experienced a traumatic stroke. After observing the conversation, she interviews the doctor and the family members, asking the doctor if he or she believes they were using empathetic statements and the family members if they think the physician had been empathetic. Comer has found that sometimes physicians think they are being extremely empathetic, but family members don't feel the same way. "We're collecting information on what empathy looks like from the physician's perspective and what it looks like from the patient's perspective," Comer said. She and Sara Konrath, an assistant professor of philanthropic studies at IUPUI, will use that preliminary data to develop a text-messaging app that will be tested with third- and fourth-year medical students who are seeing patients in hospitals and clinics under the supervision of doctors. In an earlier study, Konrath developed a text-messaging app to increase empathy among young adults. The medical students will receive texts, perhaps daily, that provide specific instructions on how to convey empathy, such as "Touch your patient on the arm on the way out of their room" or "Try smiling, and look the patient in the eye." "You might not be born an empathetic person, but you can convey empathy just by using empathetic statements or body language," Comer said. Text messaging was chosen as a delivery method because physicians are already using their smartphones for a variety of purposes. "The goal of the study is to see whether we can increase empathy through text-messaging reminders," she said. "The hope is that any physician who is trying to be more empathetic with their patients, trying to have a better connection with their patients, could benefit from using the app," Comer said. "That is important because a lot of hospitals have gone to patient-satisfaction survey models in which reimbursement for physicians is based in part on whether patients are satisfied with the physician's performance."